Successfully Added CREE T6 LED Head Torch - 4200 Lumen, 3 LED Lights, 4 Modes, IP65 Waterproof, Adjustable Focus, Portable Powerbank to your Shopping Cart. Made out of a durable and tough aluminum alloy this Cree LED headlamp is the perfect companion to bring along on your next camping trip or to simply have at hand in case of a power-off. With its adjustable and elastic strap this CREE headlight is designed to fit everybody in the most comfortable manner. Weighing less than 300 grams this CREE head torch is a useful tool to have at hand for children and adults alike. With a massive 4200 lumen of light this CREE LED headlamp illuminates what ever lies in front of you. 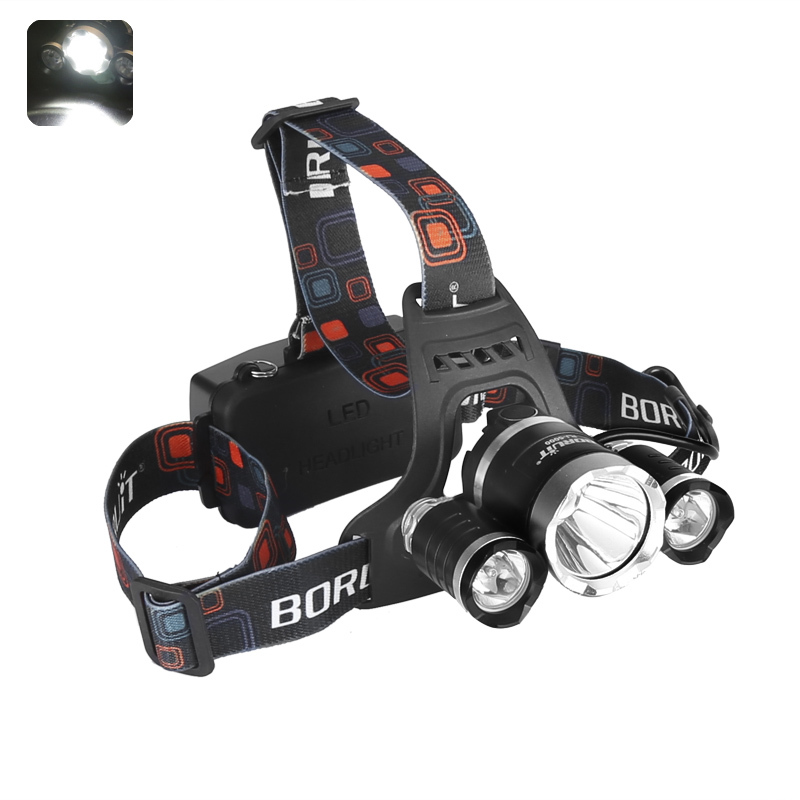 Featuring three powerful LEDs this headlamp will never leave you in the dark. Supporting up to 4 different light modes this headlight is guaranteed to offer the perfect amount of light and brightness suitable for any situation. Additionally there also is a focus wheel allowing you to widen or narrow the light, making it easier to light up large areas at once or to focus on specific details. Rated IP65 waterproof this durable CREE head torch can withstand any sort of weather condition. With a continuous usage time of up to two hours this headlamp is the perfect tool for any tradesperson or mechanic, allowing you to operate in dark areas without needlessly preoccupying your hands. Aditionally this CREE headlight features a USB port that can be used to charge your smartphone, turning this magnificent LED headlamp into a portable powerbank. This LED headlight is furthermore the perfect companion to bring along on evening hikes, camping trips, and it also offers a good addition to any car safety kit. This CREE T6 LED Head Torch comes with a 12 months warranty brought to you by the leader in electronic devices as well as wholesale LED Lights..
Arabic: - مصباح الرأس T6 كري - Chinese Simplified: - CREE T6 前额头大灯 - Czech: - CREE T6 hlavy svítilny - Danish: - CREE T6 hoved lampe - Dutch: - CREE T6 hoofd Lamp - French: - Lampe tête de cris T6 - German: - CREE-T6-Stirnlampe - Hebrew: - קרי T6 הראש המנורה - Hindi: - क्री T6 सिर दीपक - Italian: - Torcia frontale CREE T6 - Japanese: - クリー T6 ヘッド ランプ - Korean: - 크리 말 T6 헤드 램프 - Malay: - CREE T6 kepala lampu - Norwegian: - CREE T6 hodet lampe - Romanian: - Lampa de cap CREE T6 - Russian: - Фара передняя T6 CREE - Spanish: - CREE T6 lámpara - Thai: - โคมไฟหัว T6 ครี - Turkish: - CREE T6 Far - Vietnamese: - CREE T6 đầu đèn.